1) Holding the stone (often referred to as a ‘pit’) with its narrow- or pointed-side up, stick four toothpicks into the middle section at even intervals. They should go in to the stone to a depth of about ¼in (6mm). 2) Add water to a small glass until it reaches the rim. 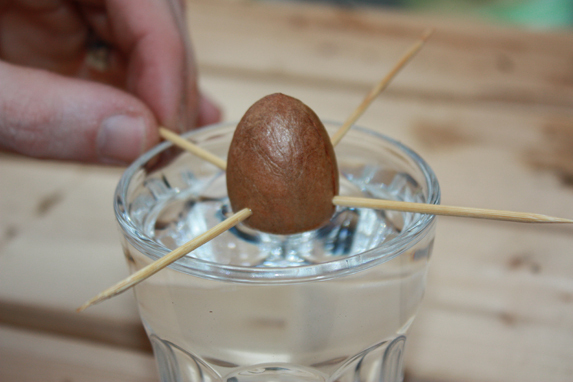 Sit your avocado stone over the glass; the toothpicks should sit on the rim of the glass, leaving the rounded base of the stone under in the water. Put on a north-facing windowsill. 3) Change the water every other day so that the base of the stone is always submerged in clean water (otherwise the rooting process is hindered). 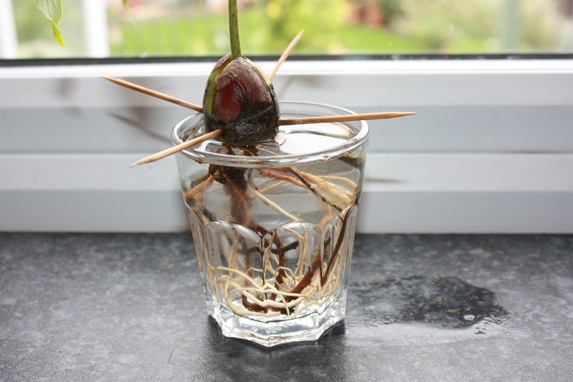 After 3-4 weeks, a tap root should emerge, followed by other fibrous roots. 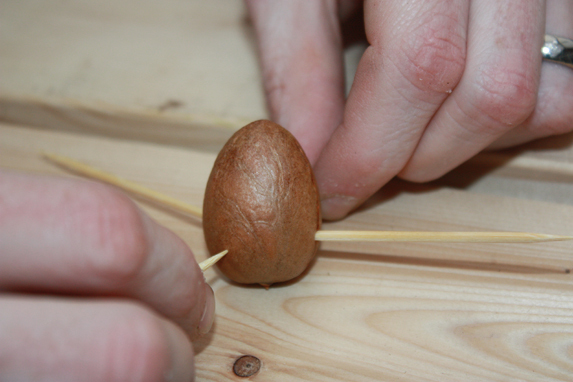 4)Soon, the avocado will sprout at the top, with one or two leaves. Remove it from the glass, and gently take out each toothpick. 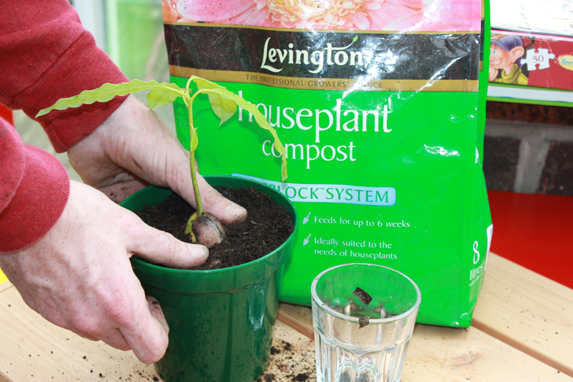 Use a small pot filled with houseplant compost. Bed in the roots and half-bury the stone. Firm it in. 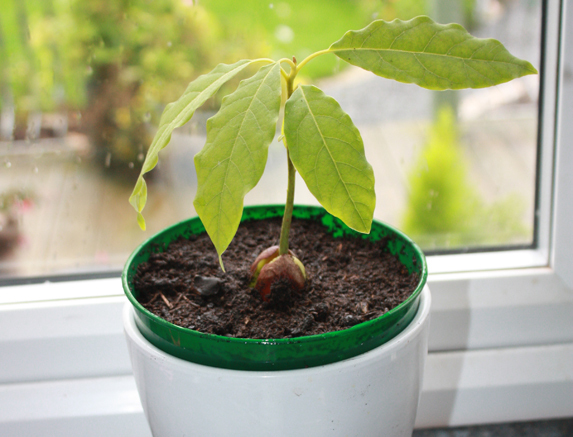 5) Place the avocado back on the windowsill. 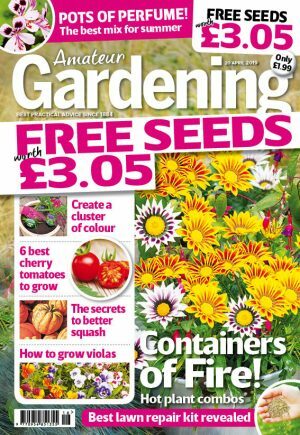 Water enough to keep the soil moist: if leaves turn brown at the tips the plant needs more water; if they turn yellow it is getting too much water and needs to dry out for a day or two.